Born to the to wealthy nobility; his father was a physician, and Cyprian studied medicine himself. Monk at Holy Saviour monastery in Calanna, Italy at age 25. Hermit on family lands in Pavigliana, Italy, spending 20 years in prayer, meditation and growing his own food. Word of his learning and holiness spread, and people came to him for medical help and spiritual advice; some tried to stay as spiritual students, but Cyprian sent them away. Abbot of the San Nicolas monastery in Calamizzi at age 60 at the request of the monks. There Cyprian became known for his austerity, adherance to the rule of his Order, his charity to poor, and his wise counsel to anyone who approached him. He rebuilt the monastery, restored its church, built a bell tower, expanded the library, worked to increase the education and spirituality of his monks, and worked during the day as a free physician to all comers. He once fell from a wagon and broke his leg, which was badly set and left him with a lifelong limp. Daughter of Luigi Viti, a gambler and heavy drinker, and Anna Bono, who died when Anna was fourteen. Raised her eight siblings after her mother's death, often working as a domestic servant to support them. Joined the Benedictines at the San Maria de'Franconi monastery in Veroli, Italy on 21 March 1851 at age 24, taking the name Sister Maria Fortunata. She was over 70 years in the Order, her days spent spinning, sewing, washing, mending - and praying the whole time. Sister Maria never learned to read or write, and never held any position in her house, but she had a great devotion to the Blessed Sacrament, and whole generations of nuns and local lay people learned from her quiet, humble, happy, prayerful example. Born to the Tuscan nobility. Studied assorted arts, sciences and languages in Venice, Italy, and would be considered a classic Renaissance man. Joined the Camaldolese in 1400 at the Santa Maria del Angelis monastery in Florence, Italy. A noted scholar and theologian, he read widely, wrote extensively, including lives of the saints, collected a large library, and translated much of it. Teacher of both religious and lay people. Superior-general of the Camaldolese in 1431. Negotiator between the pope and emperor Sigismond. Worked for re-unification with the Greek bishops at the Council of Florence in 1439, drawing up the final statement of the Council. Pilgrim to all the major shrines in Spain and then in Rome, Italy. Cave hermit in Eboli, Salerno, Italy. Layman. Catechist. Worked to help the Paris Foreign Mission Society. Arrested for his faith, he was offered the chance for freedom if he would renounce his faith; he declined. Martyr. Priest for 40 years. Bishop of Châlons-sur-Saône, France from c.484 to c.525. Saint Gregory of Tours describes him as "the glory of confessors". Bishop at Dorostorum (modern Silistra, Bulgaria). Fought against the immorality involved in the Saturnalia and other pagan festivals. Martyred in the persecutions of Diocletian. Missionary and evangelist in the areas of Artois, Hainault and Picardy, regions today in modern France and Belgium. He finally retired to end his days as a hermit near Laon, France. Fourth century bishop of Ecija, Andalusia, Spain. Martyred in the persecutions of Maximian Herculeus. Has a special office in the old Mozarabic Breviary and Missal. Monk. Abbot of Saint-Oyend abbey. Bishop of Belley, France. Hermit. 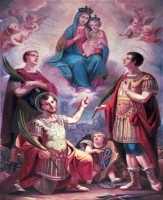 Spritual student of Saint Martin of Tours. Priest. Bishop of Angers, France c.380. Bishop of Sahgerd in Persia. Arrested with 10 or 12 parishioners during the persecutions of Shapur II. They were offered their freedom if they would worship the sun; they declined. Martyr. Ninth century monk. Hermit. Pilgrim. An opponent of the iconoclasts, at whose hands he suffered. Ninth-century bishop. 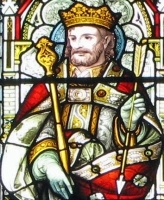 Crowned Saint Edmund as king of East Anglia in 855. Martyred by pagan Danish raiders. Monk at Lerins Abbey in France. Founded the monastery of Corméry-en-Velay. Sixth century bishop in Cornwall, England. The village of St Eval, Cornwall was named in his honour. Anchoress near Senlis, France. Martyr. Martyred in the persecutions of Emperor Maximinius the Thracian. Fifth century bishop of Benevento, Italy. Monk and later abbot of Nonantula Abbey near Modena, Italy. Group of three Christians executed together for their faith. No details have survived except their names - Basil, Dionysius and Rusticus. A group of 43 Christians martyred together. The only details about them to survive are three of their names - Agapitus, Bassus and Dionysius. Three Christian martyrs whose original stories were lost, and somehow came to be associated with the Theban Legion. They are - Adventor, Octavius and Solutor. A group of 17 religious sisters, members all of the Sisters of the Christian Doctrine, who were martyred in two different incidents in 1936 during the anti-Catholic persecutions of the Spanish Civil War.